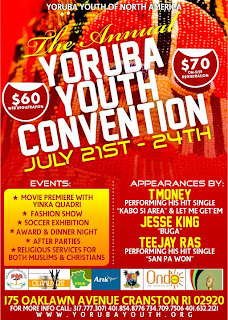 The annual Yoruba Youth Convention is back with a bang! 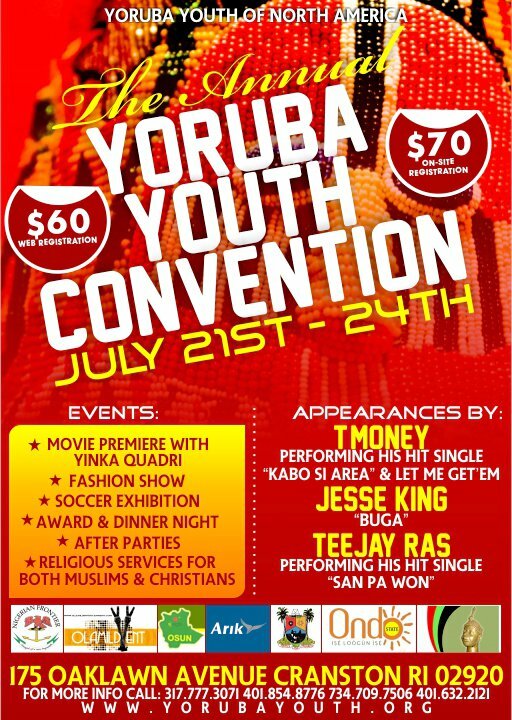 Yoruba Youth Corporation (YYC) in collaboration with other Nigerian socio-cultural organizations in North America that includes the Nigerian Frontier of America (RI) and the Nigerian Community Rhode Island will be hosting its annual National Youth Convention celebrating Nigerian culture and traditions. The theme for this year is "Awakening the spirit of patriotism and selfless service among the Youths." The convention will be held from July 21st-23rd, 2011 at the Marriot Hotel in Providence City, Rhode-Island, U.S.A. Speaking on why this theme was chosen, the producers said "We have chosen this theme, as this is a particular time of change and transition in Nigeria. Not only is the country growing economically--we are now the second largest economy in sub-Saharan Africa-- but we are about to undertake second democratic elections. As an organization, we feel it is important that the youth take part in this process, hence we have chosen to bring together like minded Nigerian youths, to discuss and find ways to be involved in the process, both individually and as an organization. We hope to educate our youths all over the world about the significance of our rich heritage."